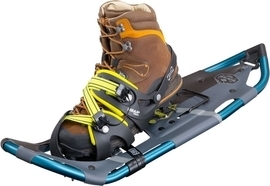 Our snowshoe rental package includes the state of the art Atlas Elektra Montane snowshoes and a pair of poles. The Atlas Elektra Montane is perfect for the steep trails in the Catskills and Adirondacks! 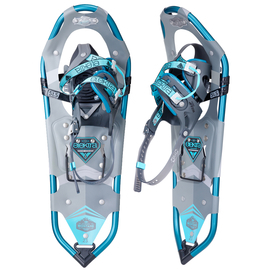 OER’s showshoe rental packages feature the new Elektra™ Montane women’s snowshoe which is designed to handle variable mountainous terrain. The women’s specific design of its elektra™ V-Frame™ and time-tested Spring-Loaded™ Suspension system provides a sturdy and versatile platform for the Montane’s comfortable, precision-fit Wrapp™ Swift binding, with the added bonus of heel lift bar to ease calf strain. Don’t let a steep summit turn you around – keep going on the Atlas Elektra™ Montane.